Introducing you to 2 more members of our studio. Carol Gohlke has been a founding member of our studio group and holds us together with her support in many ways. She is a reluctant fiber artist in that when the knitting shop was in full swing, she swore no one would be able to teach her to knit; and our friend Joy showed her differently. Since then she has tried her hand at needlefelting and has made some beautiful baskets with our soon to be member Phyllis Scarbrough. Carol is game to try most things although so far she has resisted weaving, probably cause she has seen one too many of us crawling under our countermarche looms and cursing all the bloody dangling tie ups. For now she hosts our two fiber get togethers; Tuesday 4:00- 5:30 ish and Friday 10:00- noon. Feel free to stop in and share whatever you are working on. Carol is on the right in the photo below. Our next Carol is good friend Carole Austin; fellow weaver and stained glass artisan. 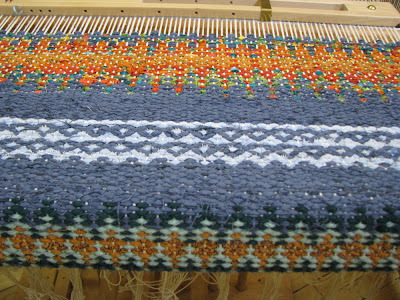 Lately we are trying to focus on learning what we can about weaving. It is good to have her there for support while we scratch our heads about planning our next projects, cause for the most part we are so new we don’t know what is going to happen till we throw those first shots. I for one am looking forward to the time when I am experienced enough to know what my weaving is going to do before I’m actually weaving it. And talk about focusing; we will have to get busy weaving cause I have talked her into sharing a booth at the Driftless Area Art Fair this year. Yikes, we need inventory! I have been very impressed with how well this fair is organized and the care and respect that they give the artists. Should be fun. Hopefully I can quit driving kids to camp and get weaving! 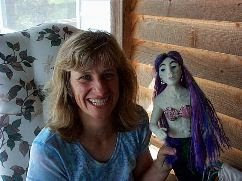 Carole and an incredible needlefelted mermaid that she gave to her daughter. oooh, I need to get working on pieces for the Driftless Fair too. It really is run very well. I just bought a new display system today- yikes!